My friend Kelly sent me a very funny story about Santa and his reindeer which no doubt must be true! fat man in a red velvet suit all around the world in one night and not get lost!! I have one more stocking to offer this year. I made this from felted ivory wool that I have embellished with vintage dogwood appliques and the most gorgeous hand sewn beaded trim. My mother in law gave me this trim, it was made for her in Korea over 35 years ago! I’m going to pop this into my Etsy shop and if it doesn’t sell then I will have to keep this beauty for myself! It’s fabulous Suzy. I’d probably have to buy it if I didn’t already have extras comin’ out of my ears! Hilarious story about the reindeer! 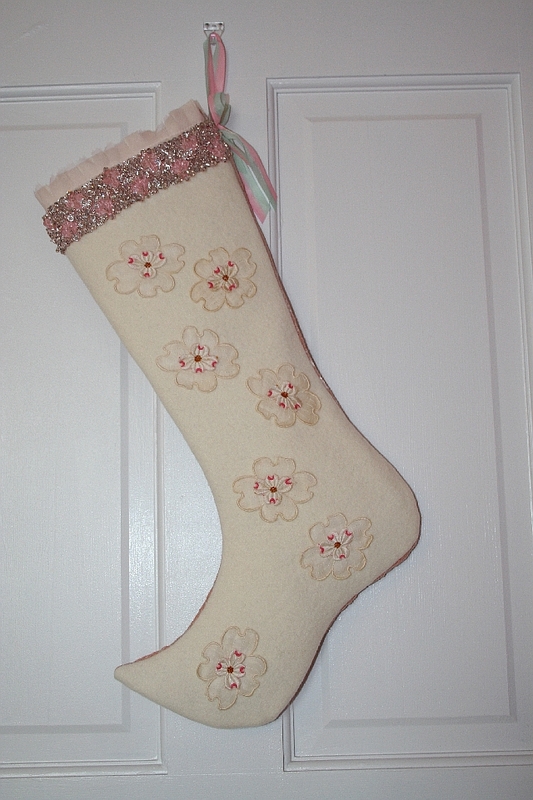 That stocking is so pretty, I love the pointy toe and the vintage trim.